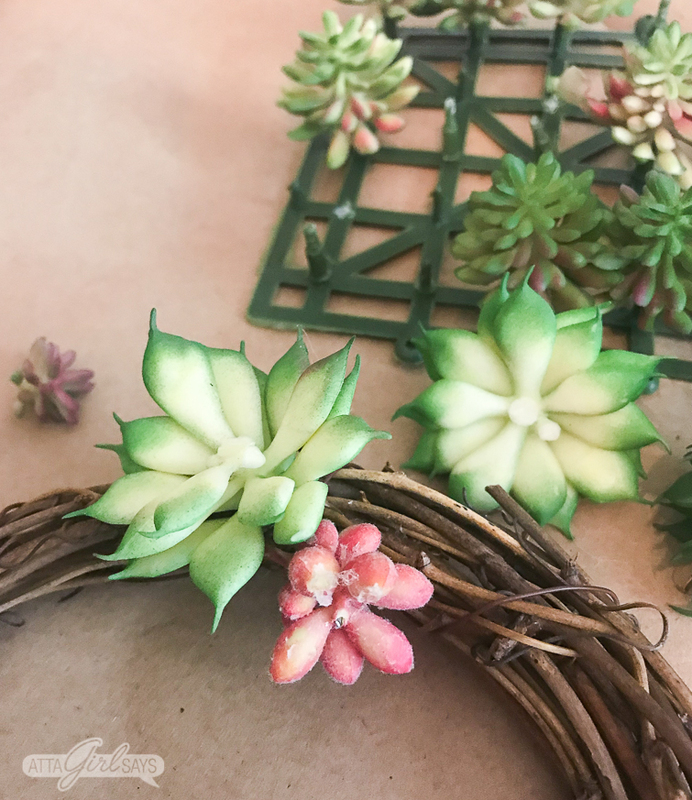 Learn how to make a realistic looking DIY faux succulent wreath to add a pretty, natural touch to your summer decor. 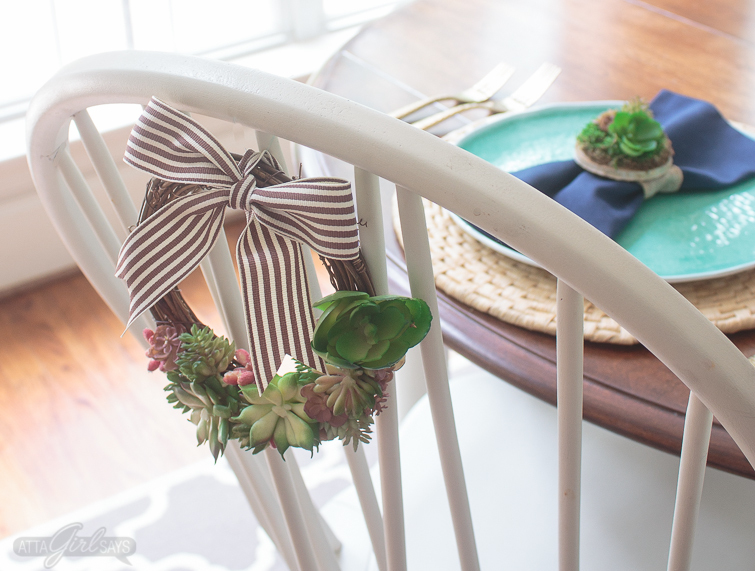 Hang the grapevine succulent wreaths on the backs of your dining chairs, on lampshades, on cabinet doors or anywhere else you like. I can’t resist a succulent. In fact, I just spent the morning replanting a bunch to use throughout our home, inside and out. If you love succulents as much as I do, you’re going to love this quick-and-easy craft — a grapevine succulent wreath using realistic-looking faux plants. 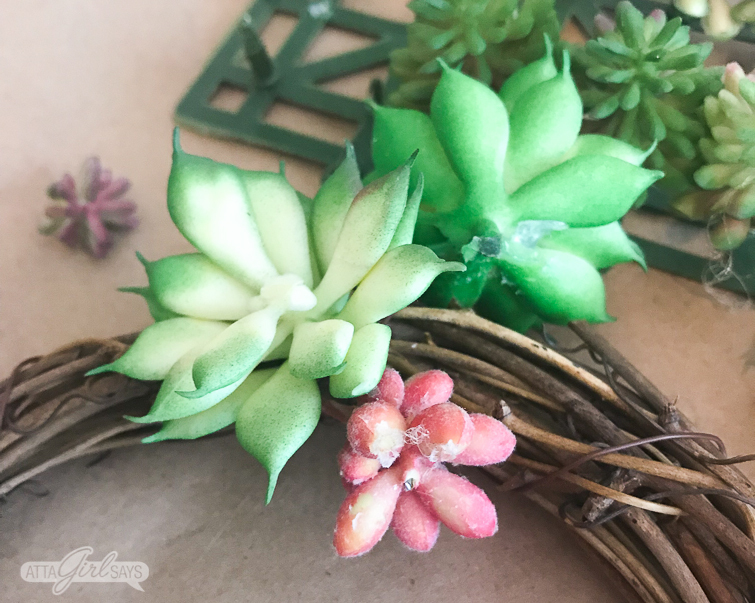 I’m also sharing a companion succulent craft project at Today’s Creative Life as part of Kim’s Celebrate Summer series at Today’s Creative Life. 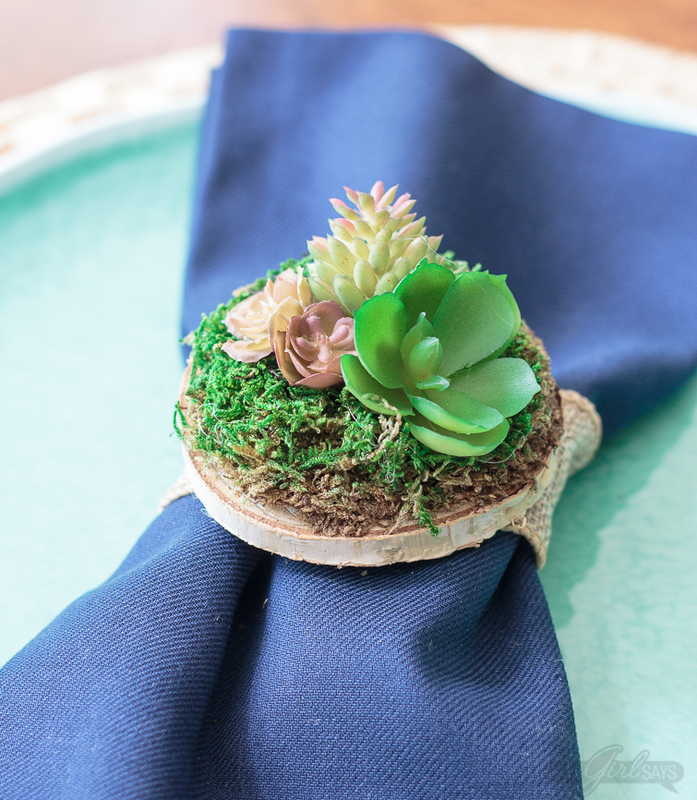 Be sure to check out the tutorial there for how to make these faux succulent garden napkin rings. You can use succulent stems or picks for this project, but for the money, the succulent mats from Michaels are the best option. Plus, the succulents are sized perfectly for this project. 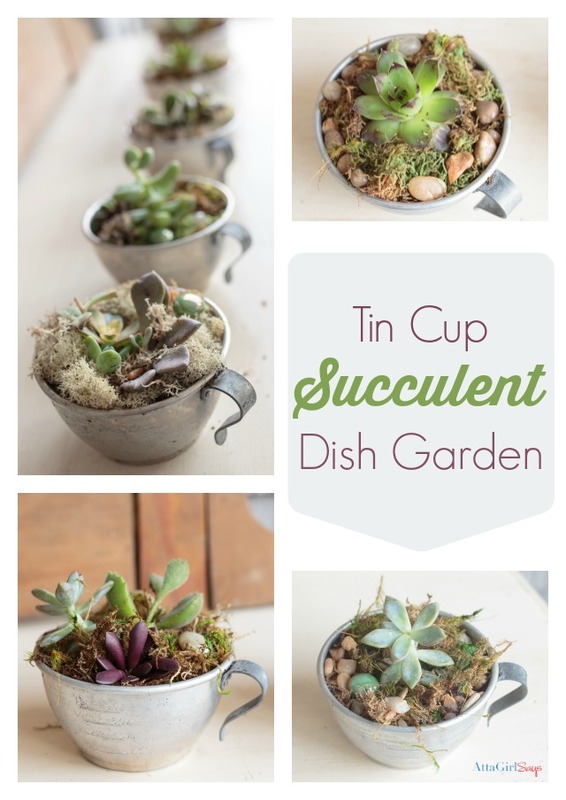 Use the wire cutters to snip the succulents from the sheet or stem. If possible, use a short stem that can be woven into the grapevine for extra security. 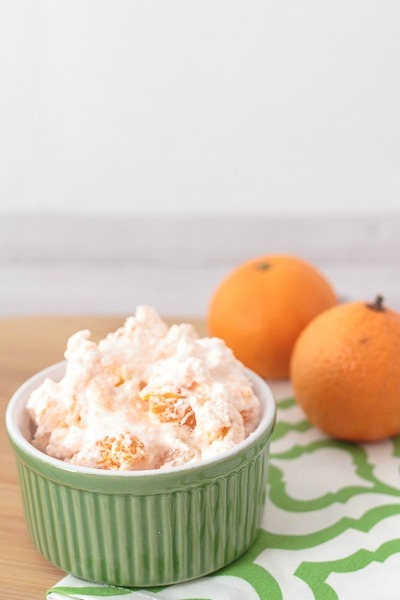 In some cases, you may be able to stick the succulent stem into the grapevine without using any hot glue. But I think it helps to add a bit of hot glue to the base of the succulent to secure to the grapevine wreath. This allows you to group succulents close together. I used a variety of different sized faux plants to create my succulent wreath. 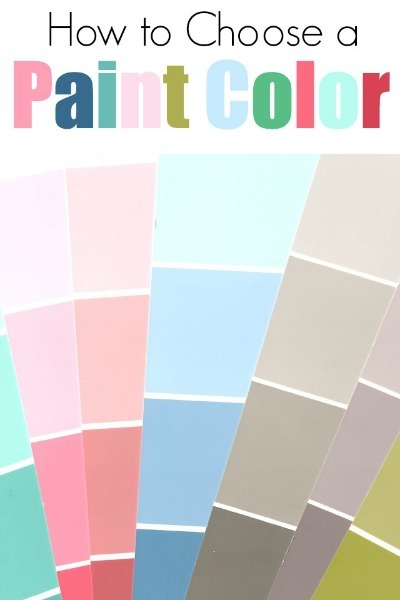 I also love the mix of colors. As you’re assembling the wreath, be sure to work in small sections and allow the hot glue to dry well before adding the next cluster of plants. 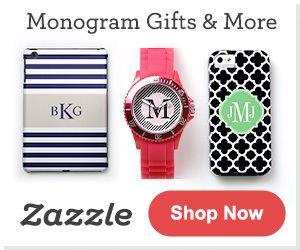 You want to make sure they’re well attached to the wreath. 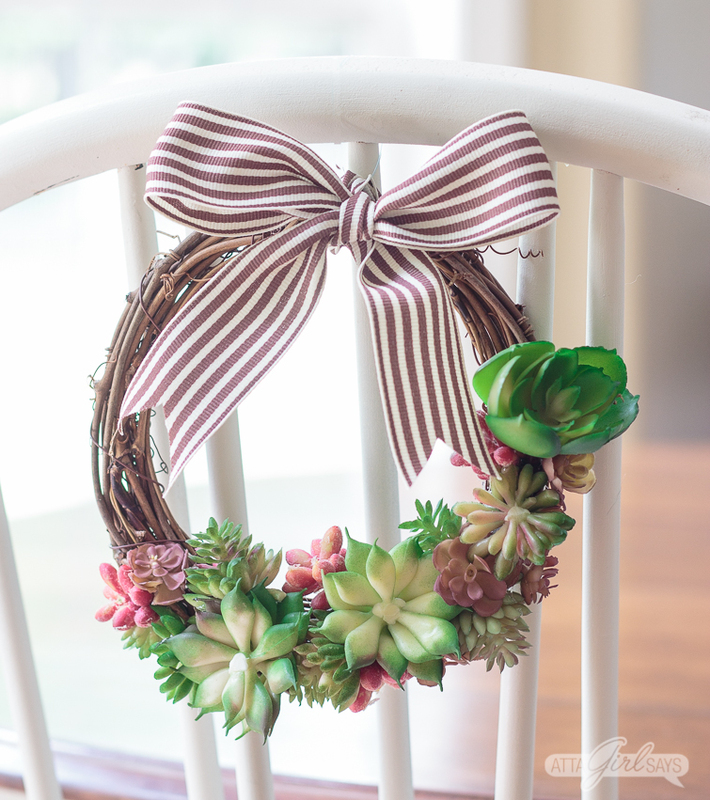 Vary the sizes of the succulents you use for visual interest, as well as to cover the grapevine wreath. I decided not to cover the entire wreath with succulents. I like the mix of plants and grapevine together, so I only covered about a third with faux greenery. 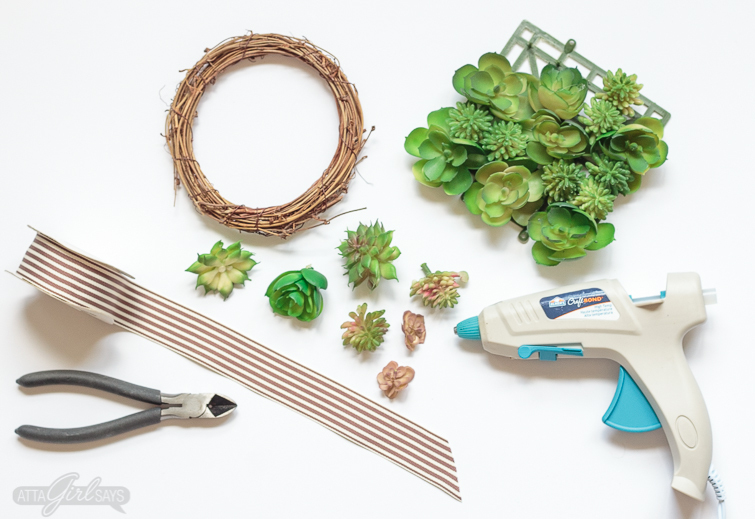 To get rid of any hot glue strings, blast the wreath with a hair dryer or heat gun and pull away the pesky threads. 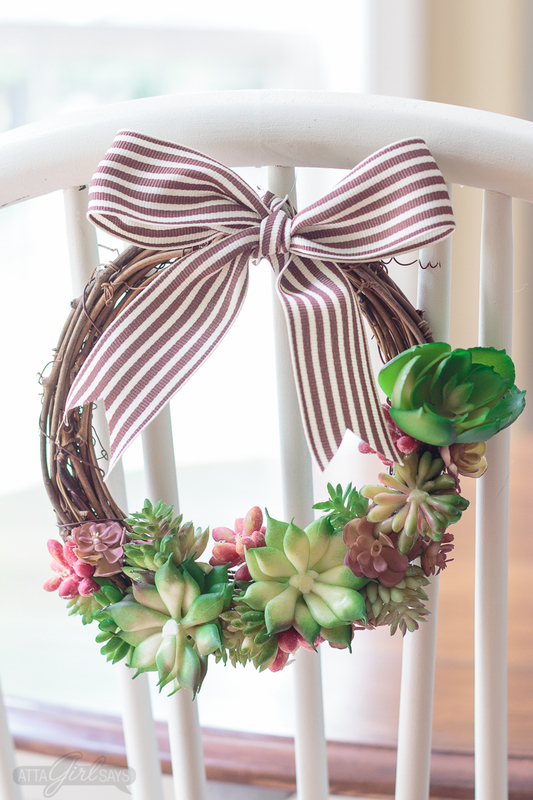 Finish with a bow, and your faux succulent wreath is ready for hanging. 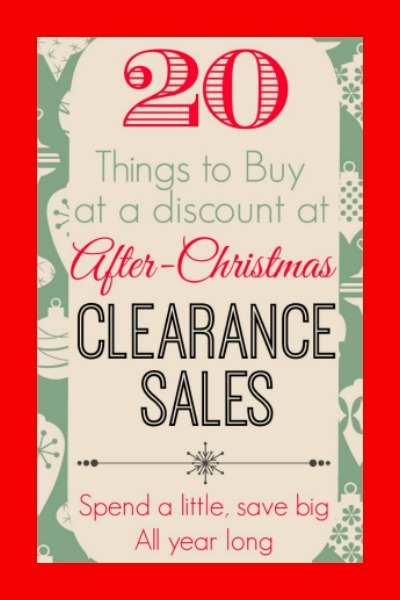 I love hanging miniature wreaths on the backs of chairs or on lampshades to add an unexpected finishing touch to my decor.